Photo: Dustin Mosher, @flyingfiddler on instagram. 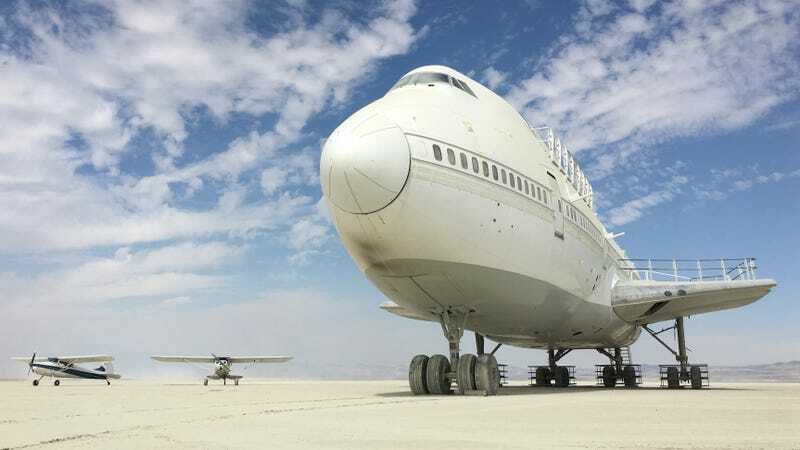 Burning Man, the community event that takes over the Black Rock Desert in Nevada for a week every year, has broken its number one rule of “leaving no trace,” as cleanup of a retrofitted Boeing 747 has been stalled weeks after the event’s permit has expired. The plane was installed under the art permits from the Nevada Bureau of Land Management that allows the festival to take place every year, and is the responsibility of a non-profit organization called Big Imagination. The plane began its partial reconstruction for use as an “art installation” for last year’s Burning Man, and returned as a nightclub for this year’s. After the event ended on Sept. 4, the plane was moved away from the Burning Man campsite 12 miles north, according to SFGate, where it’s been sitting for over two weeks. The issue came down to a private land owner, who backed out of receiving the jumbo jet at the last minute and left the organizers scrambling to find a new place to put it. According to a statement on the Big Imagination website, there is a plan in place to move the plane to a new final destination, and Ken Feldman, co-founder of Big Imagination, told SFGate that they’re working as quick as they can and hope to have it all taken care of by the end of the weekend. A pilot, Dustin Mosher, came across the plane in the desert and landed at its current resting place. You can check out more of the photos on Instagram, @flyingfiddler.